STATEHOUSE (April 1, 2019) — Speedgrip Chuck Company in Elkhart recently received the Governor’s Half Century Business Award for operating since 1946, according to State Rep. Doug Miller (R-Elkhart). According to the Environmental Protection Agency, over 50 percent of Indiana’s counties have dangerously high rates of radon gas. Radon is a naturally occurring, radioactive, odorless gas formed by radium decay in soil. Because radon is commonly found in homes and schools, I am sponsoring legislation that would require the Indiana State Department of Health to work with schools and provide important information to help better manage their air quality. STATEHOUSE (March 29, 2019) — Longstanding Shelby County businesses recently received the Governor’s Half Century or Century Business Award, according to State Rep. Sean Eberhart (R-Shelbyville). 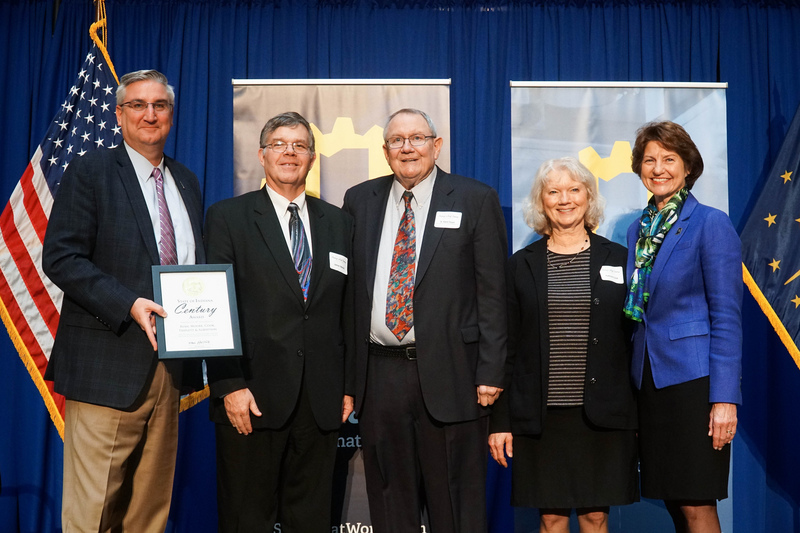 STATEHOUSE (March 29, 2019) — Longstanding Grant County businesses recently received the Governor’s Half Century or Century Business Award, according to State Rep. Kevin Mahan (R-Hartford City). This week has been one of the busiest in the legislature so far. Legislation addressing school bus safety passed out of the House unanimously. The work done on this bill highlights how the entire General Assembly must work together to pass legislation. As a sponsor of this legislation, I am grateful for all the input from stakeholders and constituents to improve safety for children riding school buses. STATEHOUSE (March 29, 2019) — Ryan, Moore, Cook, Triplett and Albertson, LLP recently received the Governor’s Century Business Award for being in operation since 1902, according to State Rep. Heath VanNatter (R-Kokomo). STATEHOUSE (March 29, 2019) – The Widney-Carpenter Family Farm was recently recognized at the Statehouse for being in operation for over 150 years, according to State Sen. Dennis Kruse (R-Auburn) and State Rep. Ben Smaltz (R-Auburn). STATEHOUSE (March 29, 2019) – The Felton Farm was recently recognized at the Statehouse for being in operation for 102 years, according to State Rep. Dan Leonard (R-Huntington)and State Sen. Travis Holdman (R-Markle). 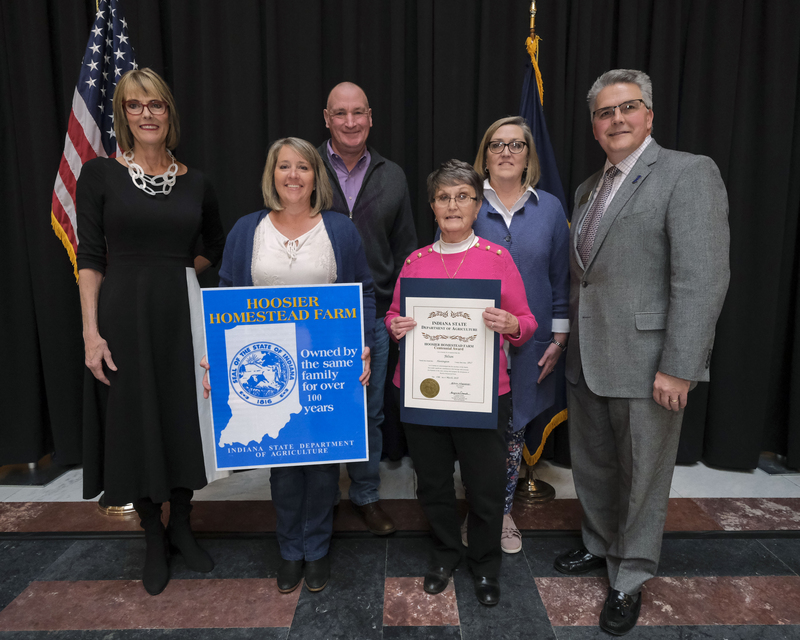 STATEHOUSE (March 29, 2019) – The Kreigh Farm, located near Ossian has been in operation since 1869, and received a Hoosier Homestead Sesquicentennial Award. This local family farm was recognized at the Indiana Statehouse for being in operation for 150 years, according to area legislators. 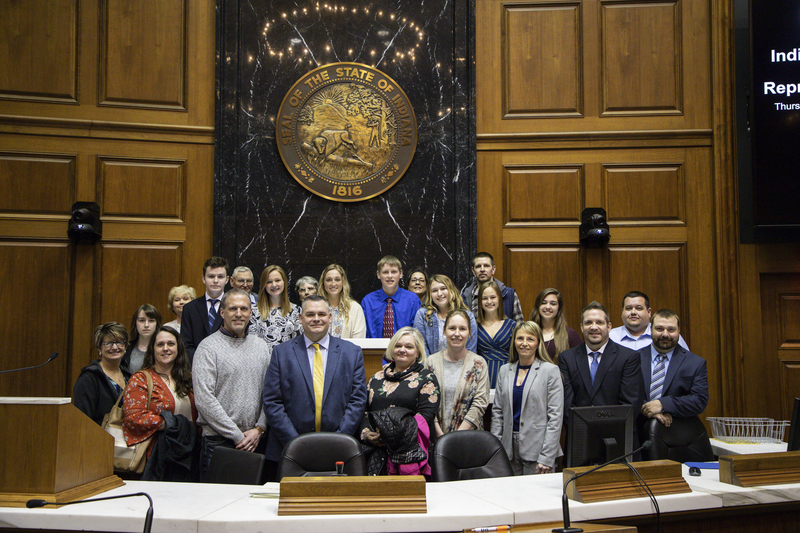 STATEHOUSE (March 29, 2019) – State Rep. Chris Judy (R-Fort Wayne) recently honored Whitko High School art students at the Statehouse for their accomplishments in the 49th World School Children’s Art Exhibition. PHOTO CAPTION: State Rep. Randy Lyness (R-West Harrison) (left) joins Vince Karsteter (right), president of Lawrenceburg Veterinary Clinic, at the Statehouse in Indianapolis to present him with a Governor’s Half Century Business Award for Lawrenceburg Veterinary Clinic’s 51 years of operation and community contributions. STATEHOUSE (March 27, 2019) — The Lawrenceburg Veterinary Clinic in Greendale recently received the Governor’s Half Century Business Award for being in operation for 51 years, according to State Rep. Randy Lyness (R-West Harrison). 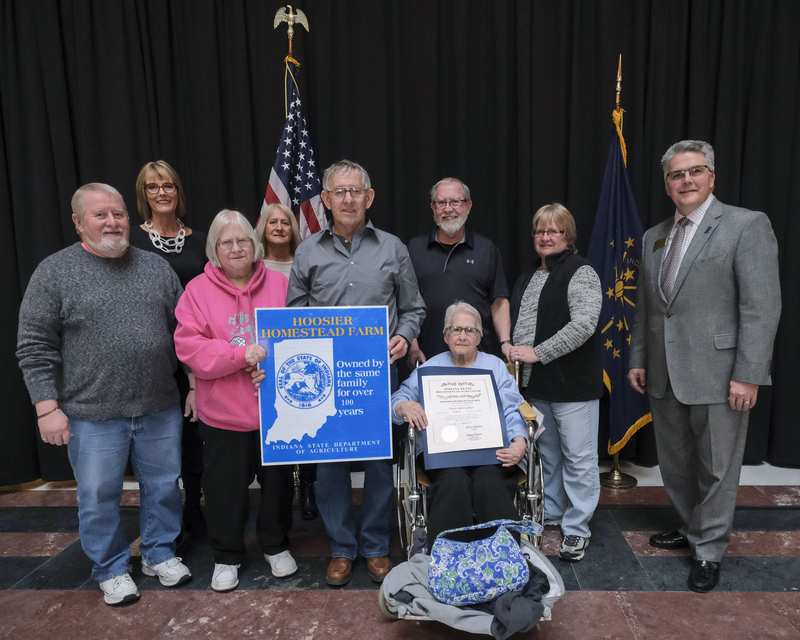 STATEHOUSE (March 28, 2019) – The Goff-Clark Farm was recently recognized at the Statehouse for being in operation for 107 years, according to State Sen. Phil Boots (R-Crawfordsville) and State Rep. Sharon Negele (R-Attica). The Goff-Clark Farm, located in Crawfordsville and in operation since 1912, received a Hoosier Homestead Centennial Award. 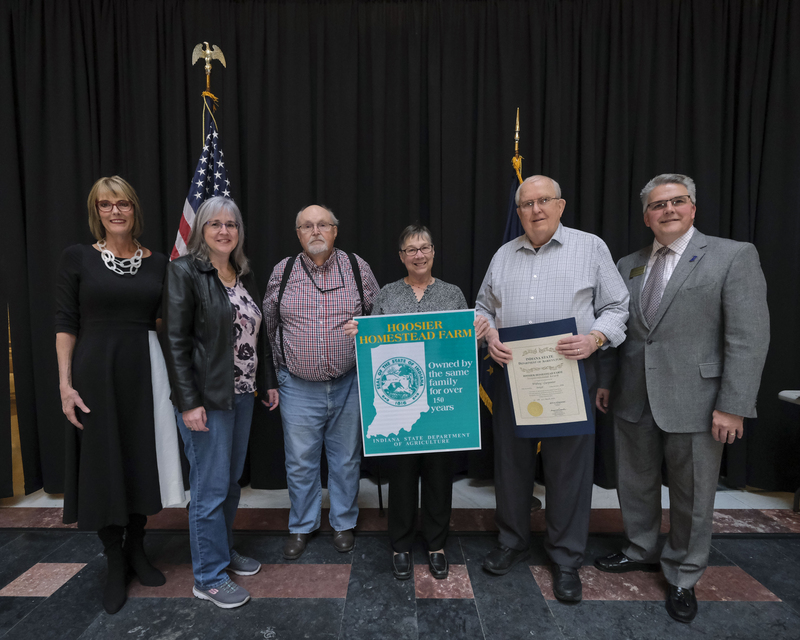 STATEHOUSE (March 28, 2019) – The Kirkpatrick Farm was recently recognized at the Statehouse for being in operation for 178 years, according to State Sen. Ron Alting (R-Lafayette) and State Rep. Sharon Negele (R-Attica). The Kirkpatrick Farm, located in Lafayette and in operation since 1841, received a Hoosier Homestead Sesquicentennial Award. 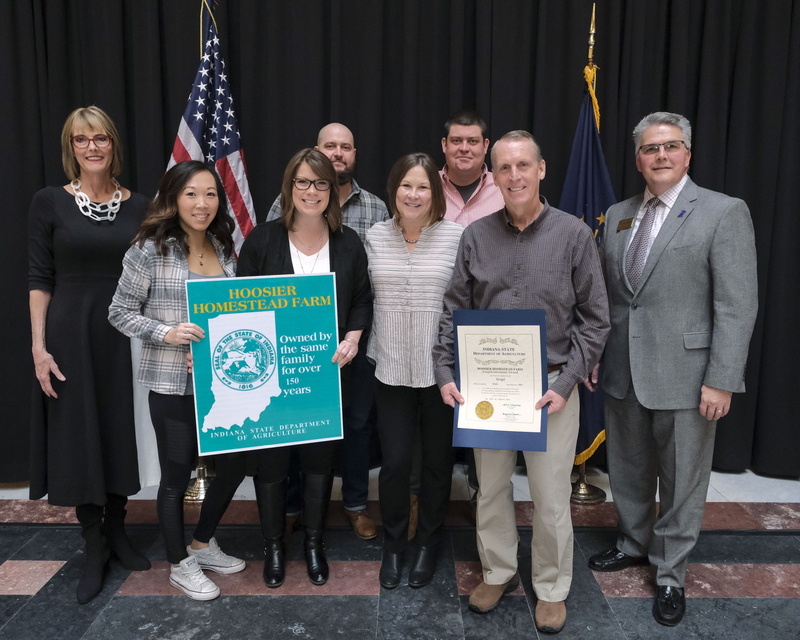 STATEHOUSE (March 27, 2019) – Local family farms were recently recognized at the Statehouse for being in operation for 100 years or more, according to area legislators. 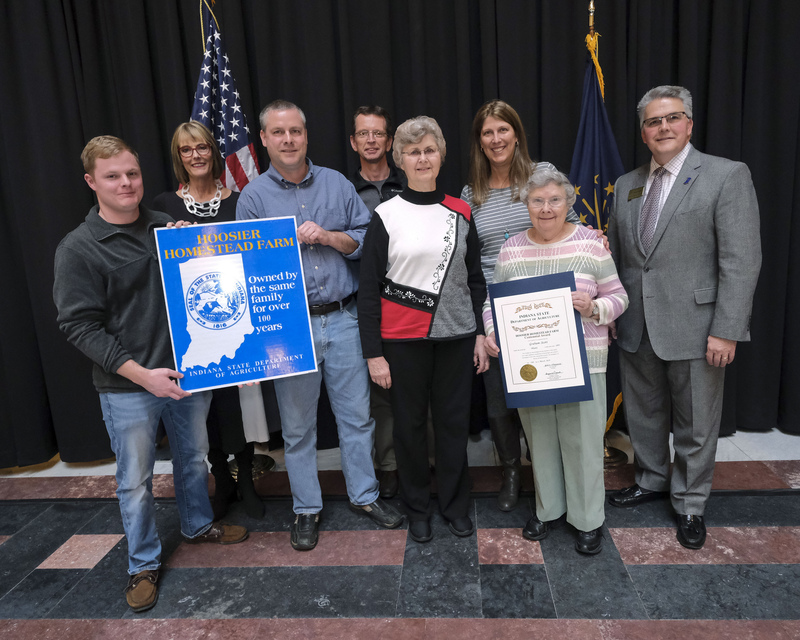 STATEHOUSE (March 26, 2019) – Local family farms were recently recognized at the Statehouse for being in operation for more than 100 years, according to State Sen. Randy Head (R-Logansport) and State Rep. Ethan Manning (R-Denver). The Graham-Scott Farm, located in Bunker Hill and in operation since 1893, received a Hoosier Homestead Centennial Award. The Vincent Farm, located in Amboy and in operation since 1865, received a Hoosier Homestead Sesquicentennial Award.